Suitable for Mediterranean tortoises in general i.e. hermanns, spur thighed and marginated. See the russian/horsfield section for baby horsfield care. 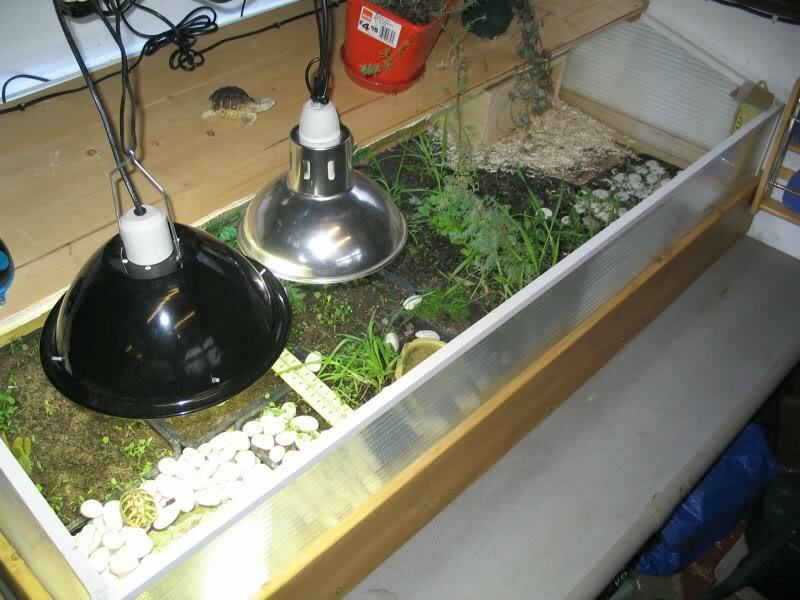 These indoor enclosures are suitable for a couple of hatchlings and with correct placing of lamps and hide area, will provide an excellent microclimate for either end of the season. Note the use of various different substrates to make life more interesting for the little ones. The top part of the sides are constructed from twin wall polycarbonate, to allow maximum entry of natural light. Trays are removable for reeseeding and allowing recovery of plants having usually been eaten by greedy tortoises. It is a good idea to have some safe but none edible plants too, to prevent gorging on seedlings and supply a place to hide. Mature plants provide better fibre than young seedlings along with less protein. It is important to realise that indoor enclosures should be looked upon as temporary set-ups for use at either end of the season. The best habitat for your Mediterranean tortoise is an outdoor one. Indoor enclosures are also useful for sick tortoises for close observation and when a tortoise is on medication, especially antibiotics when ambient temperatures need to be kept higher than usual with no drop off at night. Sometimes people ask, after changing a tortoise to a table or outdoors after using a vivarium, why their tortoise is hiding away. Occasionally some will change back to a viv with the idea they are doing what is best for their tortoise as he appeared not to like the new setup. In fact, it does not matter which way you change things, a tortoise will more often than not, hide away for a few days until he gets used to the change. Tortoises escaping from a small enclosure into the vast area of a garden will also hide a away, as so many are witness to, when looking for an escaped tortoise. 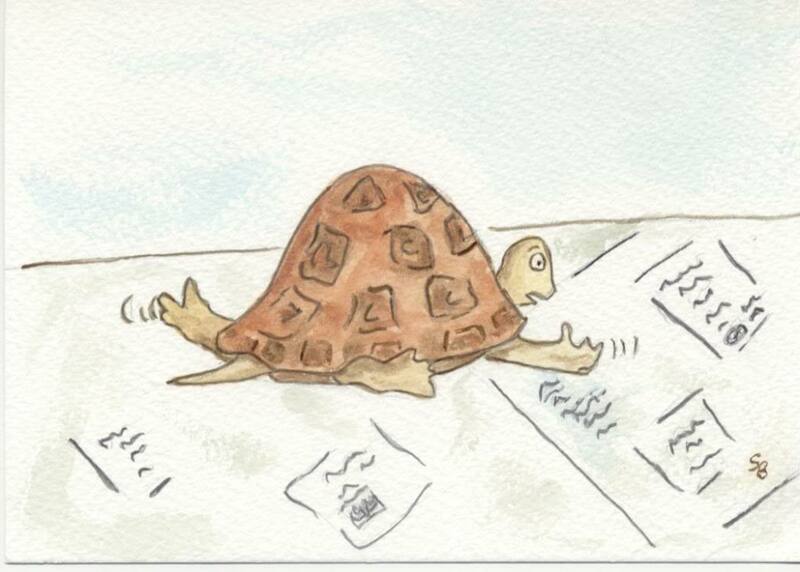 It is always best to give them time to adjust to a new environment before deciding your tortoise does not like it. Avoid split level enclosures as these are not very well tolerated by tortoises as they are a ground dwelling species. Give as much room as possible with high levels of lighting. Lighting links are on the links page. Both soil and coconut substrate are excellent for thermoregulation purposes. For this to be effective, you do need to water it regularly similar to a plant in a pot. If you spray the substrate it disappears almost immediately into the air, so by watering, it stays damp underneath and just dries out on top. Don't let it dry out completely as if it is moist underneath it will help with smooth shell growth. Coconut substrate is really easy to rehydrate, so this is an easy substrate to work with. Many captive tortoises become pyramided or lumpy, which is partly to the shell being too dry. They need dry areas during the day and when basking, but overnight will benefit from higher humidity. If they don't dig down overnight, it's a good idea to lower the temps as in nature. With just a couple of small tortoises, I remove the obvious soiling daily as I see it and give a full replacement clean around once a month. Soil can be left a little longer, but spot cleaning still needs to be done as you find it. Tortoises usually urinate when bathed, so giving regular baths will help keep the habitat clean. Larger tortoises do better outdoors where nature will take care of cleaning, but during dry spells an occasional hosing will help. 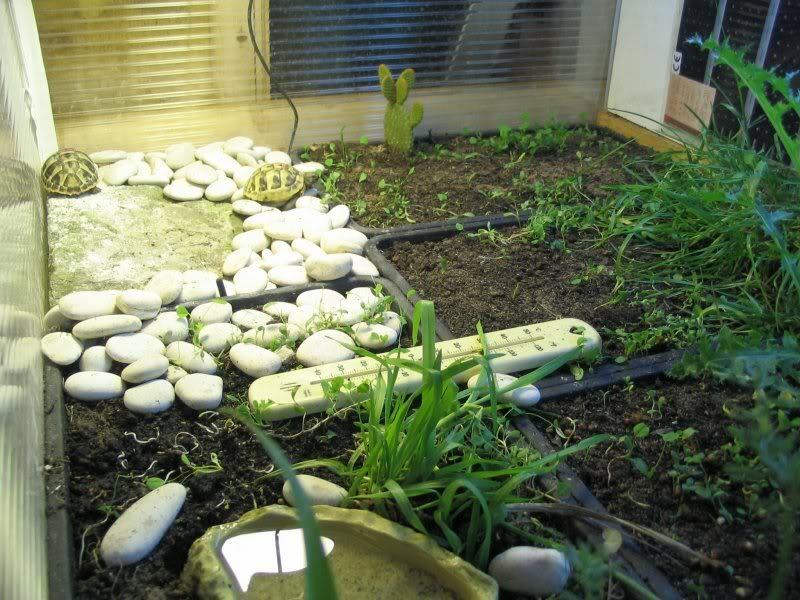 Tortoises are creatures of habit, so don't usually take kindly to having a complete swap around of the layout, tending to either hide away for a while after the event or tear about stressing about it all, so when replacing substrate completely, it's important to replace items as close to the former arrangement as possible. Avoid such substrates as corn or alfalfa pellets which are high in protein and not good for tortoises if ingested. Equally, do not use newspaper as this does not allow the tortoise to dig and if used for any length of time can cause leg problems due to the tortoise not being able to make correct purchase with the ground. Worn scales can occur on the sides of feet due to attempts to dig and walk correctly without anything to grip. Nails sometimes grow unevenly and at strange angles too when not given correct substrate. When using soil it is a good idea to water it as you would a plant in a pot. This way it will not become powdery and will enable tortoises to dig correctly. Under the basking lamp it should bake hard the same as garden soil in the sun. It is imperative that a microclimate is created so that a tortoise can choose the best place to spend the night or get away from heat etc. When a tortoise buries into its substrate it is conserving body fluids and not just attempting to keep warm as it may seem. Bladder stones can form in tortoises which are allowed to dehydrate even for a short time in what would appear to be an ideal environment. Even with regular bathing, given incorrect substrates, this can and does happen.Experiments have been done with hatchling tortoises using various substrates to determine the likelihood of this happening and it has been found that without adequate depth of substrate it is far more likely that tortoises will develop problems in the next couple of years of their lives. A note to anyone thinking of buying cosy bedding for the hide area, as you would for rabbits and guinea pigs. Don't waste your money as tortoises are cold blooded and only use the hide as a shelter. In the wild they would hide under bushes or rocks to avoid predators along with digging down into the soil. It does not matter how much bedding you provide they will not be any warmer until the lamps/sun shine the following day. It's actually very important for the temperature to drop significantly overnight just the same as in nature, which assists with good growth.